The Peak District is rich in archeological remains some dating back to the stone ages, one of the most important being Cresswell Crags. This is a series of caves that represents the earliest human occupation in the Derbyshire/Nottinghamshire area. Whilst just outside the Peak District per say, it’s well worth a visit for those interested in the this era. There are literally dozens of other archeological sites in the area, particularly Bronze Age stone Circles, the best known of which are Arbor Low (south of Buxton, just off the A515) and The Nine Ladies stone circle on Stanton Moor near Youlgreave. Nearer to home at Spring House Farm there is an Iron Age Hill Fort on Mam Tor. For Viking and Saxon remains Repton in South Derbyshire was a major Viking and then Saxon site and is worth a visit too. For those of you that enjoy historic sites and English country houses, Derbyshire is full of them! Some of the major ones remain in the hands of the of the various dukes and barons that own them. The first stately home to open to the public, it remains the model and innovator in this market. Stunning art, architecture, gardens and parkland with a great adventure playground for the kids and a petting farm too. The first farm shop to open is here too. A must visit. You can park for £4 and just enjoy the parkland and courtyard shops or buy individual ticket for the gardens, adventure playground and house as well as a full ticket. Please check the website for opening times and prices. A stunning manor house with Elizabethan gardens. Owned by the Duke of Rutland the property is frequently used as the set for period films and costume dramas. In my opinion the gardens are amongst the most beautiful in England. Like other historic homes it hosts lots of events. Please check the website for details of opening times, charges and events. 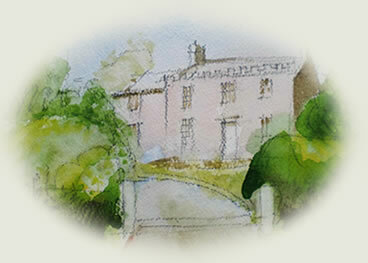 A Jacobean moated hall with lovely gardens it is located just off the A515 between Buxton and Ashbourne. It remains home to the FitzHerbert family. Again, please check the website for more details. Both the National Trust and English Heritage own a number of sites and landscapes in the Peak District, so if you have a membership card for either or both they can be used to the full. All listed below are worth visiting. Do visit their websites for a variety of events, opening times and charges. A large National Trust owned large Elizabethan Hall and gardens. Built in the 1590s by the fabulous Bess of Hardwick. It is located east of Chesterfield at J29 of the M1. You might want to visit along with Bolsover Castle. A stunning 18th century mansion with Adams interiors set in lovely parkland and located just north of Derby. This remains the home of the Curzon Family. National Trust owned. Closer to home, about 15 minutes from Spring House Farm, a Jacobean manor house which has been lived in by the Wright family for over 330 years and set in the historic plague village of Eyam. A delightful mix of heirlooms with a little bit of real word Ikea! National Trust leased. For fans of Jane Austin and specifically Mr. D’Arcy, Lyme Hall and parkland was rather famously used in the BBC’s adaptation of Pride and Prejudice. Lovely parkland set between Disley and Stockport on the A6. National Trust owned. A landscape, walks and excellent tea room in one of the most beautiful parts of Derbyshire off the A515 between Buxton and Ashbourne, near Tissington. National Trust owned. Built in the 17th century by the Cavendish family (Chatsworth and Hardwick Hall), it is on the original site of a 12th century Castle belonging to the Peverel family. Beautifully restored with lots of events. English Heritage owned. On our doorstep, a 12th century Norman keep set above the village of Castleton. There is a step climb but the reward is the view of the Hope Valley. English Heritage owned. For those of you with a particular interest in that period, Mary Queen of Scots spent much of her long imprisonment in Derbyshire including Bolsover Castle, Hardwick Hall, Wingfield Manor and the Old Hall, Buxton (now a charming little Hotel). This makes an interesting if sad trail. Derbyshire is one of the homes of Britain’s Industrial Revolution. Sir Richard Arkwright’s Cromford Mill was the world’s first water powered cotton spinning mill. Dating from 1771 this model made Arkwright his fortune and was quickly copied by mill owners in Lancashire, Germany and North America. Cromford Mill is the centre piece of the Derwent Valley Mills, now a World Heritage Site with a fascinating series of mill complexes stretching over a 15 mile site between Matlock Bath and Derby.